As we walk in toward the thorns, I hear a distance voice, perhaps voices, and feel a pain, very like rebuke. I look about, but it is not His voice. I see no one else about, nothing that should be speaking to me. I try to ignore it, but the voices are distracting. The pain grows to the point where I cannot ignore it. “Papa, these voices, this pain, what is it, where is it from? It is not Your voice. What am I hearing?” I am finally forced to ask under the increasing pressure of the discomfort. “You are hearing voices of rebuke. That is true, and they are not from Me. These voices are the voices of the vows and judgments you have made. These are the decisions you have made about how you see and understand the world. They constantly speak to you, deceive you, cause you pain. You have been walking under these voices for a long time. It is time now to silence them, that you may hear My voice alone.” He explains. I wonder for a moment what that might be like. I realize now that these voices are familiar, a constant companion. What might it be like to walk without them? My thoughts are broken by the first true obstacle in the path. 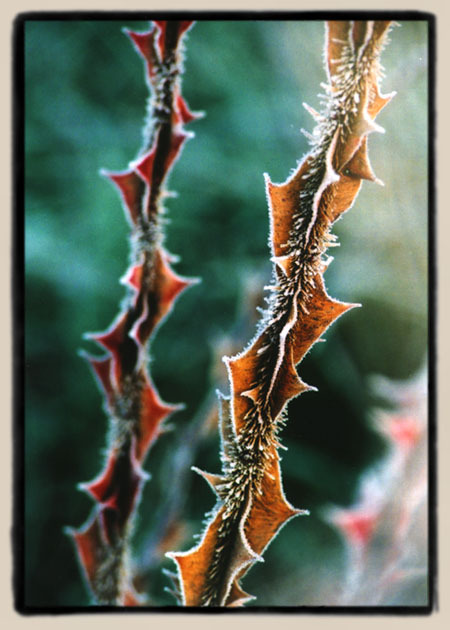 The thorny canes form a wall though which we cannot walk. “We must crawl through these thorns, that is the only way through.” He directs, guiding me down to ground, beside Him. On hands and knees, we crawl beneath the thorns. I feel enveloped by these dangerous, oppressive plants, caged and restrained. The more I look about, the more frightened I feel myself becoming. Just as I feel panic setting in, I realize that He shelters me with His own body, covering me from the dangerous spines. I am thankful for His presence, knowing I could not make it through here on my own. We seem to go on for a very long time, deep into the growth of canes. As we go, the voices I hear seem to grow louder and stronger. Deliberately I choose to ignore them, focusing instead on His voice, His presence. Finally, we come to a small break in the thorns. As we draw closer to the break, I see a huge, spreading cane rooted deep into the ground. He had said there were three roots to these thorns, this must be the first of them. We seem to stare at the huge growth for a long time. I have no idea what to do, baffled by the very sight of it. “What must I do, Papa?” I finally ask, with a grave reluctance. His response seems cryptic, but it is something I can do. I press into Him as He continues to shelter me from the dangerous spines. Taking a deep breath and biting my lip I set to listen to the very voices that I have been trying to ignore. For a long time all I can hear is a cacophony of random sounds, becoming louder and louder as I listen. It seems the harder I listen, the less I hear. I am afraid of listening to this, but in His presence, I find I can summon the courage. “Papa, help me to hear this voice. Help me!” I cry in frustration. The voice seems to become a picture and it becomes clearer now. In my minds eye, I see myself as a very little girl, four or five years old. At that time we had gotten a poodle puppy. The dog, as it grew, took a dislike to my baby sister, it liked me though. Eventually we had to give the dog away as a result of its dislike of my sister. I was well aware of these facts, but in this picture, I see something I have never known. I see a little girl very attached to the little dog, heartbroken that the pet must be given away. Yet at the same time, she is not allowed to grieve over the loss because it was happening for a ‘good reason’. Distant emotions well up in me, rapidly overcoming my composure. Deep, wracking sobs overwhelm me and I cry out with a grief buried for many years, a grief denied, disallowed so many years ago. I hear the voice of that little girl, bereft at losing her only friend, with on one to understand or accept her grief. In the depth of her grief, she cried out to herself ‘No one will get close to me again. This will never happen to me again!’ As so it has been. 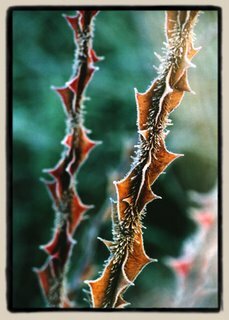 I have built up walls and thorns to keep all from coming to close. These same walls keep forcing me back, away from any who would try to draw close. No one can get close so that I will not grieve this way again. Another wave of grief overtakes me and gut wrenching sobs pour from my soul. I cannot contain them. A distant part of my mind notices that He is holding me now, in His powerful arms, cradling me as I spill out my grief in my tears. I cry there for a long time, until my sorrow is spent and there is nothing left. Only then can I see what I must do next. I am totally spent now. I find that I am laying with my head in His lap. I do not recall how I came to be here, but I am grateful for it. I had no idea of these feelings within me, so long had they been buried deep, but the walls build out of them are unmistakable, undeniable. He says nothing for the moment, letting me rest and regain some strength. I am thankful as I have no words so speak, nothing left from which to respond.